My brother has been living in the Lakewood Estates for several years now. We like the place. We're looking for another community because the price has become too high. They dont really do anything; he just lives there. They cook and clean for him, provide the facilities, have stuff for him to do, and take him places. They dont provide any medical assistance or things like that. It is an attractive place that's nice and clean. His car is there, but he drives it minimally. The only thing we've found is that, sometimes the food is not the greatest and run out of food. The food is a big issue to us. They have a menu, but sometimes when they get to him and he goes to order from the menu, they would say, "Oh, sorry. We don't have any of that." Or they serve something to him frozen. The cleaning staff and the rest of the staff are a 5, but we had a problem with the management when he moved. They clean his apartment and bed very nicely weekly. I think they can do a little better when it comes to activities. Lakewood Estates is a beautiful place. I could walk over it from my house. The apartment shown to me was the best of all of the places I visited because of how it was set up. The apartment was on the main atrium level right around the corner from the dining hall and it was about 550 square feet. They also had one space in a covered parking garage, which I specifically liked. It did not have a balcony, but its backdoor opened up into a wide garden area. They have several units like that on the ground floor. They allowed smoking a little bit away from the building. The staff was very nice and very accommodating. It was a very nice experience. They do an excellent job of keeping up everything, like their atrium area, their outside areas, their maintenance stuff, and with painting. They're always doing something to maintain the property. Hi Loren, thank you for visiting us at Lakewood Estates. It was a pleasure having you stop by, and we are glad to hear you enjoyed your tour. If you have any questions or concerns, please don't hesitate to reach out! We hope to see you again soon! My mom was very hesitant to move into independent living but she finally admitted that she was very lonely living at home by herself. The move has been good, she is finally eating three meals a day and is getting involved in a few activities. That's a work in progress. She loves the staff and her apartment that is just the right size for her. Very positive experience. The location was surprisingly quiet but close to Belmar and grocery stores. The people that lived there all seemed very happy, friendly and warm to each other. The staff was very helpful, the salesgirl was patient with us and made us feel at home right away as did the activities girl. My father is very excited about moving in with them. Lakewood Estates and its staff are good. I am living in a nice apartment. My wife went to a chair exercise program, but she didn't like it. It's not perfect, but it has been good. The food is better than adequate. The rooms at Lakewood Estates are large, clean, and bright. Their dining area is very nice, very appropriate, and each table seated 4 people at a time. The staff is very nice, too. I think it costs too much. My mother is at Lakewood Estates. I can’t say anything negative at all. She loves her apartment. The people there are so very nice and very friendly. The only thing that she is disappointed about is there aren't many crafts and she likes to do crafts, but other than that, she doesn't have complaints. The dining area is very nice and very clean. Everything is always ready when they say it’s going to be ready, and she has not complained one bit about the food. We signed a contract with Lakewood Estates but within 24 hours, she didn't want to move. The staff that took us to the tour was friendly, knowledgeable, and didn't pressure us. We made several visits and met with several folks who were very knowledgeable. It was a clean facility and seemed homey. The one concern that we had was the driveway entrance was really steep and parking was minimal. The grounds were nice. The kitchen was not she was hoping for. Lakewood Estates was a very lovely place. I would recommend it to anyone. The people were very helpful in what we needed to do in preparations for moving my mother-in-law. They had lots of activities, and they had one resident who was in-charge of the Bingo -- who was from the Northeast where my mother-in-law was -- and she was looking forward to meeting her. They were remodeling at that time, and they hadn’t finished their exercise room, but they were setting it up, and you could see what all they were going to have in there. It was a very nice facility. We toured their dining area, and it was very nice. The new parts that they had finished were very nicely laid out and set up for the residents. My mom is at Lakewood Estates. We’re very happy with it. The staff is very friendly and knows everybody by name. My mom has not been going down for meals for the last month, but when we were going down in the beginning, the food was very good. They have daily activities. She has a nice room with a small kitchenette. It seems really clean since they come and clean her room once a week. Lakewood Estates is the cheapest around, and everything has been excellent, so we think it’s really good value. Lakewood Estates was very nice. The rooms were very small, much like a hotel room. The staff was very friendly. Lakewood Estates was fine, and the property was well maintained. My mom has already signed the lease and is moving in at the end of this month. I think they did a better job renovating the apartments when a resident moved out. They are in the process of renovating the lobby because it’s a little bit dated and old but well-kept. I had been visited Lakewood Estates before, it’s a really nice facility, and I like the staff as well. It’s very nice layout in the common areas, and the rooms were very spacious. They have managers that live on site. Pricing scale is nice, and they tried to keep the general rent down. The grounds nestled into a nice little wooded ground. Most of the views from windows are looking out over trees and not a lot of buildings and parking. I'm at Lakewood Estates. It's in a residential area. They seemed very friendly, and the price was about right compared with other places. They've done a whole bunch of activities. The food is satisfactory, and there are restaurants nearby. I liked the location of Lakewood Estates because it was in a more active area with shopping malls and restaurants, but it is a more dated facility with low ceilings and was less bright and less warm. They provided me with a list of activities for the entire month. It needs some upgrading, but the place is fine. We visited Lakewood Estates for my father. The people were friendly, and I enjoyed touring the place. The one thing that was a drawback was that they didn’t have full kitchens. There was a small refrigerator and a microwave, but there was no cooking option.The staff was very friendly and answered all of our questions. They did everything they could to accommodate us and to offer a good option for my father. The rooms were clean, and size-wise, they were good. The patios and location were nice. This is a nice facility. Kris is very helpful, and does a really in depth interview. I could live there if it was closer to my childrens' home. We visited Lakewood Estates. I really liked the place, but we didn’t like their floor plan, which felt like a hospital room and freaked out my mom. She didn’t like that. They offer activities for the residents. They would not bring meals to your room, which is not an advantage on our part. Otherwise, they were great but a lot more expensive than the other place I visited. I visited this independent living facility with my mom. We met with a lovely woman, one of the resident managers, who was upbeat and warm. It was clear that she truly cares about the community and residents. I loved seeing that. They have underground parking which was important to my mother because she is still driving. They have wonderful line up of activities for the residents as most do, but I am only giving this three stars because I felt the apartments were outdated, the exterior was in need of painting and the common areas were not as clean as I want for myself. I visited Lakewood Estates. It was wonderful. The girl that took us around was very sweet and thorough. She showed us everything and told us all about it. They were very sweet and nice people. Their rooms were beautiful. The ones that were empty, they're fixing up. It was very nice. I would definitely live there if I was more independent. They have exercise class and dancing. The facility was clean, but there was a cigarette smell to the hallways. The rooms smelled great though. I like how clean and pretty it was. I was basically impressed with the staff of Lakewood Estates. The rooms were very nice. They had a swimming pool and two big garages. The staff is friendly, and the residents seem happy at Lakewood Estates. It is comfortable. They have numerous exercise classes, beanbag baseball, card games, and Wii bowling. The food is OK. It is in a residential area. There is a mall and a medical facility nearby. Lakewood Estates was very helpful, and we found it to be very nice. It is very nice, but it is just for independent living. We are interested in a continuum of care from independent to nursing care, and we wanted to find a place that offers all the services. It is very fine, and we thought it was excellent. Everything is excellent, so we gave it a high rating. The room is OK, but it did not have a kitchen facility, and we want that. They have excellent food services, but there is only room for a microwave and a coffee maker in the kitchen. It is a lovely place, but we are not ready for anything right now. My mother likes living there because she enjoys the friends she has made, and it is clean in the common areas. Otherwise, I have been extremely dissatisfied with the management, and the lack of cleaning the staff does in my parents apartment. The initial saleswoman was aggressive; not caring that the facility provided an inappropriate level of care for my ailing parents. She mentioned we could hire in care for my parents, but never offered valuable information regarding the on-site caregivers located in their facility. Because both parents had recently been released from 24-hour nursing care, we had to spend thousands of dollars for assistance when the manager could have told us about the service located right on their premises. Or better yet, respected that they could not provide the care my parents needed and not convince weak and disoriented octogenarians that they would be cared for appropriately. Additionally, not 24 hours following my father's death, the "floating managers" treated my grieving family with unforgivable disrespect, rudeness, and lip service. They inappropriately and unprofessionally used of the title of "Floating Manager" as an excuse for reprehensible behavior. They made a difficult day even more distressful and robbed us of the peace we need to cope during a time when we should have been given grace sincere compassion. What I really like about Lakewood Estates community is it's really close. I'm in a scooter, in an electric wheelchair. This is close to little shopping. I could go to Walmart, and I could go up the street with little hobby shop. It's beautiful, charming, but it was completely residential. It was pretty comfortable. They were very friendly. I thought the rooms were wonderful. I think it didn't have stove, and they just had a small refrigerator. I kind of wanted a little bit more. I don't cook very much at all, but I do want that option. They had card games and bingo. I thought their clientele were a teeny bit older. They just seemed like they were quieter, very serene, and calm. I like the area. It's really nice. Lakewood Estates was a very nice facility. It was very pretty. It is near a big shopping center. It did have the same type of amenities like the other facility. The staff there was very nice. The pricing was about the same for what you get. You can get a studio apartment, a one-bedroom, or a two-bedroom. They also have a kitchen so that if their residents have their families and they want to cook for themselves, they can use that kitchen. My mother-in-law is at Lakewood Estates. The place is very clean. The food is pretty good and the people are very nice and very friendly. My mother-in-law is very happy in there. My mother is comfortable at Lakewood Estate. She just likes the atmosphere, they have a lot to do. It's close to the church and to her hospital or home service agency. She's very happy with everything. Lakewood Estates is very close. It's only about 7 miles from us, so we can get over there in a hurry. The staff is very good, they got nice room, and the food is good. It's a pretty nice place. 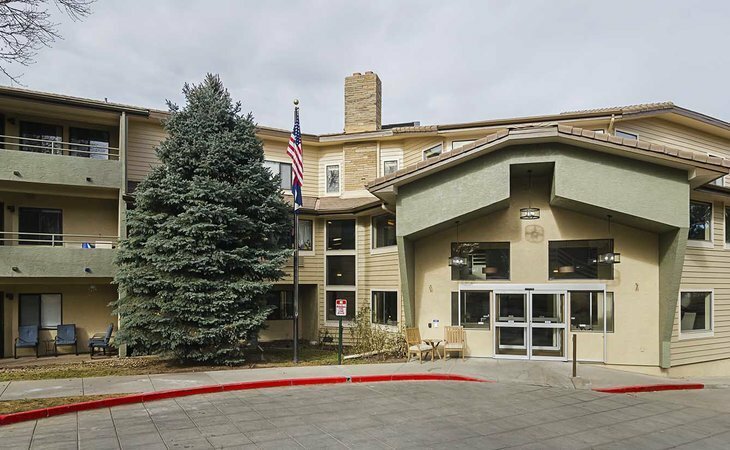 Lakewood Estates is located in Lakewood, CO, providing a vibrant backdrop for your new life as a valued member of our caring community. So come to Lakewood Estates for a visit...and stay! What should caregivers and potential residents know about Lakewood Estates?